Do you believe I took less than 30 minutes to bake these? I'm not lying... With no preheating of oven and photography, I think I can bake these in less than 25 minutes!!! Baking these little friands is super fuss free and easy as all I need is a whisk and a mixing bowl and no fanciful equipment such as electric mixer or processor is required. What is friands? These little French cakes are typically made with almond flour and egg whites and are baked in small molds, mostly in oval or barquette shape. They are typically moist, buttery and quite fashionable to eat. Wikipedia is right! ... saying that these French cakes are actually very popular in Australia and New Zealand. We can bake friands with any fruits, nuts or chocolate but I like to bake mine now with summer fruits for our Christmas... Summer fruits at this time of the year? Unlike everyone in the Northern hemisphere, we are celebrating Christmas with lots of sunshine and summer in Australia. For all these years that I'm living in Melbourne, we often dashed to the market on Christmas eve to buy at least a tray of mangoes and kilograms of fresh cherries for us to "hibernate" at home during our long Christmas break. However, instead of using fresh fruits to bake, I'm using up the last bit of my frozen stash of fruits as I need to clear up space to freeze new batches of summer fruits soon. 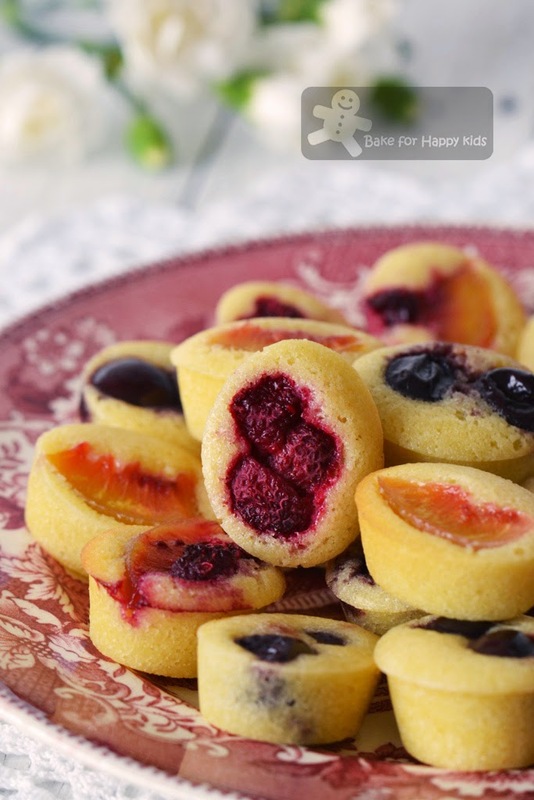 My son and I love fruity friands the most especially when I baked them into these tiny bite size as we can pop each in one mouthful. These frozen fruits were semi-thawed in the fridge on the night before the bake. Thus, zero mins required. All I need is a wooden spoon and a mixing bowl to mix the cake batter. Mixing is about 1-2 mins. Assembling these cakes takes me about 3 mins and baking is 15 mins. Do you think I need 5 mins to cool and display these cakes? Less than that!!! Let me test one first before serving the rest to my family. Yum! Preheat the oven to 180°C (350°F/Gas 4) or 160°C fan forced. Grease and flour a non-stick 12-hole friand tin or 20-hole miniature friand tin. Mix together the ground almonds, icing sugar and flour. 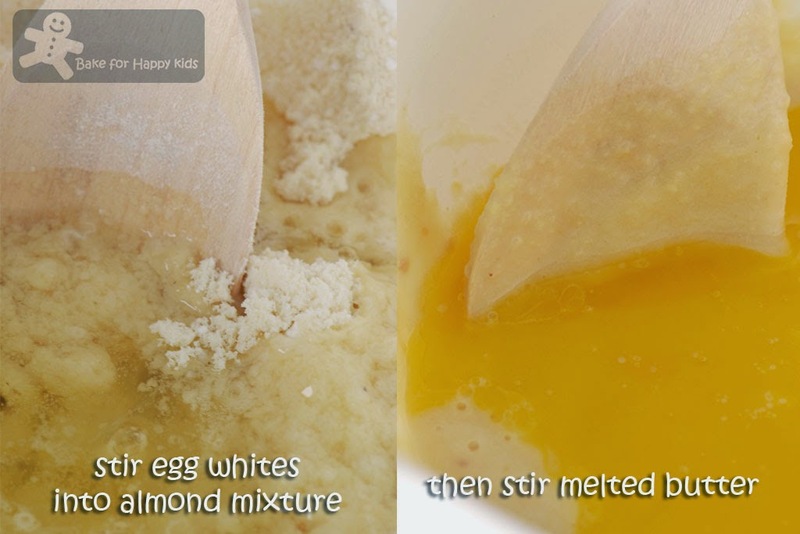 Stir in the egg whites until just combined. Stir in the melted butter. Pour the batter into the tins. Pit the cherries and cut in half (I use the cherries as a whole without cutting them). 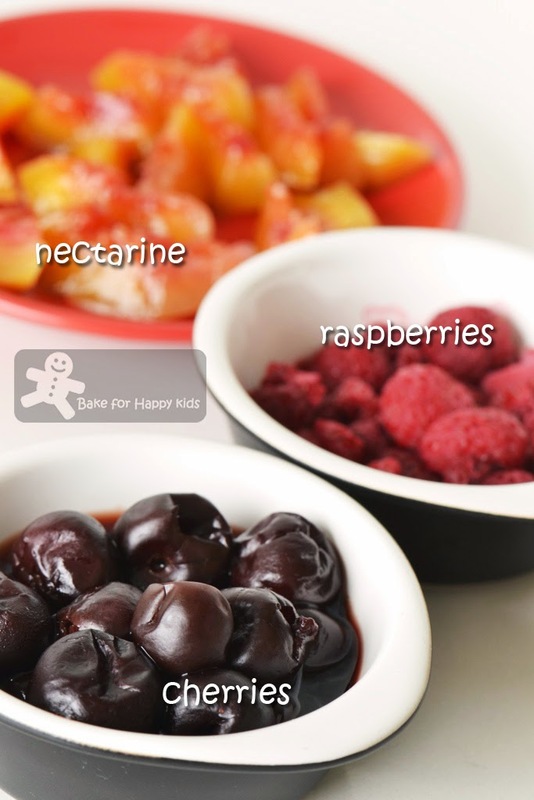 Arrange a few cherry halves or raspberries or nectarine pieces on top of each friand. Bake for 25-30 mins or until pale and golden (I baked the small ones for 15 mins). The friands should spring back when touched. Remove from the oven and leave in the tin for 5 mins before turning out onto a wire rack to cool. Dust with extra icing sugar (I didn't do that) and store in an airtight container. Note: Using half of the recipe, I have baked 20 small friands. I have used (1) 1/4 cup of pitted cherries (2) 1/4 cup of raspberries (3) 1/4 nectarine, thinly sliced to top my small friands randomly. 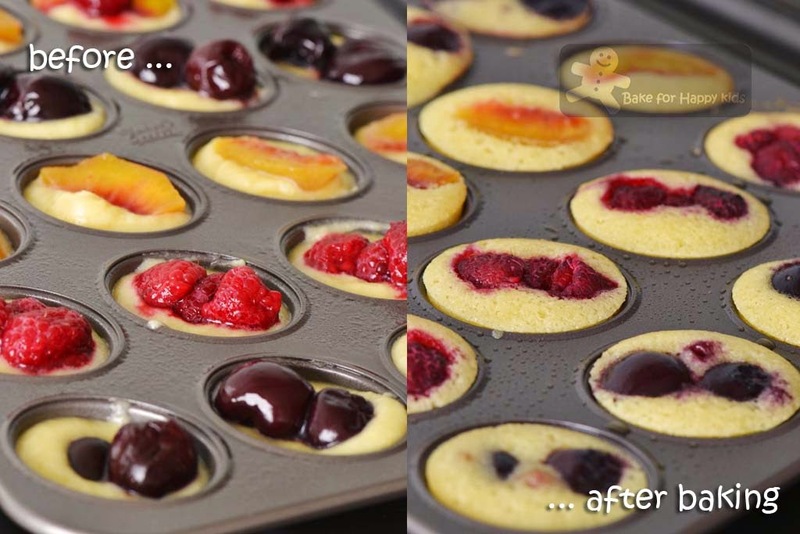 The frozen fruits were semi-thawed in the fridge on the night before the bake. I'd be hard pressed to choose one! Happy Holidays, Zoe! Takes 25 minutes to make? Must bookmark this, hehe.. I have all the ingredients except ground almond.. Oohhh uses only egg whites, must be very light.. The mini cakes look so so pretty, with colourful fruits inside.. Love them all! Zoe these look really beautiful!! I like the fast and easy recipe, this suits me. When you describe these friands as moist and buttery, I want to give it a try. OMG How yummy!!! I love soft fluffy cake bits and with those bits of fruit! These are perfect for guest coming to the house! Great recipe Zoe, I would love to make these but I'd probably make them in my regular sized cupcake tray! Zoe, these fruity friands are really pretty! These friands looks yummy! Sounds especially good with all the fresh berries! Anything that takes under 30mins to bake deserves a big thumbs up from me, especially if it looks this amazing! 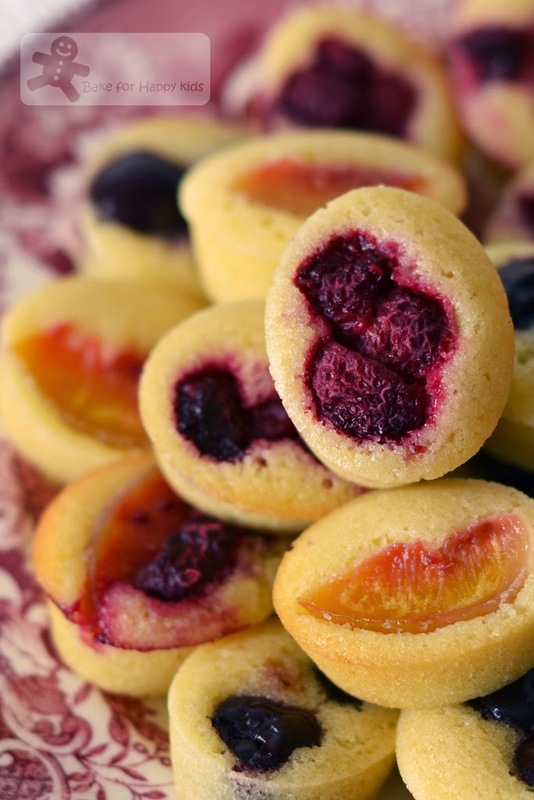 I love friands as they are easy to bake and healthy too. I LOVE that these friands are made with egg whites and also with frozen fruit. Perhaps I can add a bit of sunshine to Marion's dessert menu with these. They sure look delicious and oh so quick to bake up! Looks so darling. I think I'm going to try to make tomorrow. I have to go to a little gathering and I'm sure everyone will love these friands. i am sitting in the cafe having the yuckiest sandwich ever... looking at ur friands makes the sandwich taste better! Hi Zoe, love your yummy & cute fruity friands ! Photography always adds a good hour to my recipes! ;-) These look superb -- thanks. Your friands are so pretty and cute! You are always so creative in your baking!